Tilting: Gold Winner in The Wishing Shelf Book Award! I was featured on the Cool Tools podcast this week! Cool Tools is a website of uncommonly good tools started by Kevin Kelly, one of the co-founders of Wired Magazine, and Mark Frauenfelder of Make Magazine and BoingBoing fame. I have been an avid follower of both and loved the opportunity to chat with them about my favorite tools! Please click here to listen to the podcast! Lynette Hintze at the The Daily Interlake did a lovely profile of me for the paper. Click here to read it. Lovely review of Tilting by Lara Lillibridge. "Harkin’s candor is refreshing as she examines her childhood and early adulthood—she doesn’t shirk at revealing her own immaturity as she details the complicated family in which she was raised." The Hill Rag, a local paper in DC, ran a lovely review of Tilting. I am still blushing. 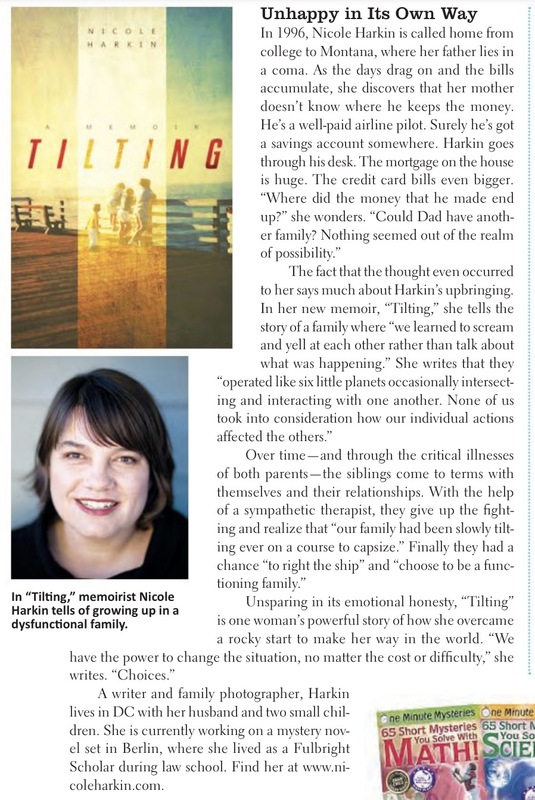 "Unsparing in its emotional honesty, 'Tilting' is one woman's powerful story of how she overcame a rocky start to make her way in the world." Short video of Tilting Book Launch Party. Enjoy...while I hide behind this plant.